Welcome to all of the National Cornbread Festival attendees. It was our pleasure to bring these brunch recipes to you on the festival stage this year and know you'll enjoy making them in your cast iron. Thank you to Chef Tamie Cook for sharing the stage with me - I hope you had as much fun watching as we did sharing. Cheers! Fork-sift or whisk 2 cups of the flour in a large bowl, preferably wider than it is deep, and set aside the remaining 1⁄4 cup. Make a deep hollow in the center of the flour with the back of your hand. Pour 1 cup of cream, reserving 1/4 cream, into the hollow and stir with a rubber spatula or large metal spoon, using broad circular strokes to quickly pull the flour into the cream. Mix just until the dry ingredients are moistened and the sticky dough begins to pull away from the sides of the bowl. If there is some flour remaining on the bottom and sides of the bowl, stir in 1 to 4 tablespoons of reserved cream, just enough to incorporate the remaining flour into the shaggy wettish dough. If the dough is too wet, use more flour when shaping. Lightly sprinkle a board or other clean surface with some of the reserved flour. Turn the dough out onto the board and sprinkle the top of the dough lightly with flour. With floured hands, fold the dough in half and pat it into a 1⁄3- to 1⁄2-inch-thick round, using a little additional flour only if needed. Flour again if necessary and fold the dough in half a second time. If the dough is still clumpy, pat and fold a third time. Pat dough into a 1⁄2-inch-thick round. Brush off any visible flour from the top. 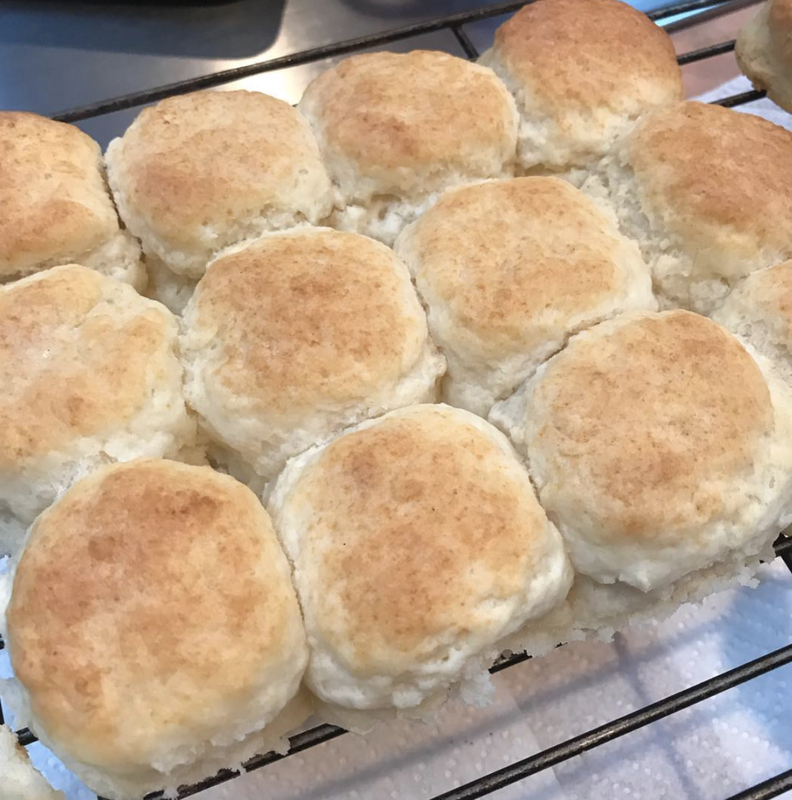 For each biscuit, dip a 2-inch biscuit cutter into the reserved flour and cut out the biscuits, starting at the outside edge and cutting very close together, being careful not to twist the cutter. The scraps may be combined to make additional biscuits, although these scraps make tougher biscuits. Using a metal spatula if necessary, move the biscuits to a seasoned 10 1/2-inch cast iron skillet. Bake the biscuits on the top rack of the oven for a total of 10 to 14 minutes until light golden brown. After 6 minutes, rotate the pan in the oven so that the front of the pan is now turned to the back. Continue baking another 4 to 8 minutes until the biscuits are light golden brown. When the biscuits are done, remove from the oven and lightly brush the top of the biscuits with softened or melted butter. Turn the biscuits out upside down on a plate to cool slightly. Serve hot, right side up. *If your biscuits didn’t brown enough, brown them lightly —watching carefully!—under the broiler. Remove root ends of spring onions and a couple of inches off of the top ends and discard those. Thinly slice the white and light greens parts. Thinly slice the dark green part and reserve for topping finished frittata. Cut off woody ends of asparagus and discard. Cut remaining asparagus into 1-inch pieces. Cut out stems of the Swiss chard leaves and thinly slice. Roughly chop leaves. Heat a 12-inch cast iron skillet over medium heat. When hot, add oil and when shimmering, add white and light green spring onion slices. Stir 30 seconds and add asparagus and Swiss chard stems. Cook until asparagus and chard stems are tender, about 5 to 6 minutes. Stir in chard leaves and cook 2 to 3 minutes, until chard gives up water and the water evaporates, stirring occasionally. Meanwhile, beat eggs with a wire whisk in a large mixing bowl. Whisk in cream. Season with 1/2 teaspoon salt and 1/4 teaspoon pepper. When chard is ready, pour eggs over cooked vegetables. Stir a minute to distribute vegetables evenly. Sprinkle with crumbled goat cheese. 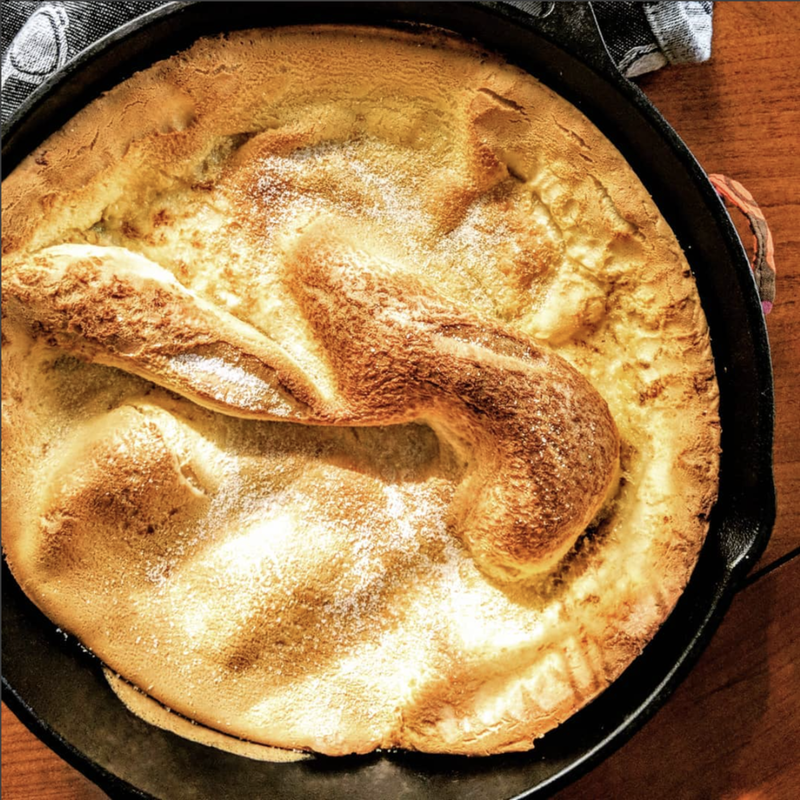 As eggs begin to set, reduce the heat to low, and slip the edge of a spatula under the edge of the frittata to allow uncooked egg to escape under the cooked eggs. Cook about 3 minutes. Move skillet to the hot oven and bake about 10 minutes, until eggs are fully set. Remove skillet from oven. Run a spatula around the edge of the frittata to loosen, and invert onto a serving platter if desired. Sprinkle with reserved spring onion slices and parsley. If frittata sticks - no worries! Just flip it back into the skillet, top as directed, and serve slices from there. Place two tablespoons of the melted butter into a 10-inch cast iron skillet and place in the oven. Set the remaining tablespoon of melted butter aside to cool slightly. Wait 10 minutes before assembling the other ingredients. Place the milk, eggs, flour, sugar, cornmeal, salt and remaining tablespoon of melted butter into the bowl of a food processor or blender and process for 30 seconds. Carefully pour the batter into the preheated skillet. Bake on the middle rack of the oven for 30-35 minutes or until the edges are puffed and brown. Sprinkle with additional sugar and serve with lemon wedges for squeezing. My love affair with beets came relatively late in life. I'm only sorry I didn't know their tender texture and subtle sweetness much sooner. If you have someone in your life is still on the fence about beets, this may be the recipe that will help them turn the corner! To roast the beets, cut off stem end and wrap individually in aluminum foil. Roast on a baking sheet at 400 degrees for 1 hour, or until beets are fork-tender. When cool, slip off the outer peel (I use disposable gloves for this - beet juice stains everything it comes into contact with!). Allow beets to cool after roasting. Whisk together the vinegar, mustard, and sugar in a small bowl. While whisking, slowly drizzle in the oil and continue whisking until the dressing is emulsified. Whisk in the herbs. Slice, quarter, or grate the beets, depending on size. Sprinkle with goat cheese. Pour dressing over beets. Season to taste with salt and pepper. Top with chives before serving. Refrigerate if serving cold, then top with chives for serving. The calendar may say fall, but in Georgia we are still sweltering! Bring on the no-cook supper! Toss the chicken, celery, onion, nuts, and grapes in a large bowl. Stir together the mayonnaise and sour cream or yogurt in a small bowl and mix into the chicken mixture. If it’s too dry, add additional mayonnaise as desired. Season to taste with salt and pepper. Serve on lettuce leaves, sandwich bread, or rolls. Welcome Atlanta & Co. Viewers! Marinating the chicken at least 6 hours or overnight infuses the chicken with quintessential Jamaican flavor. The Scotch bonnet pepper is traditional, but substitute with one you know. If you are a little heat-averse, use just a small portion of the pepper. I like to serve this with rice, and sliced fresh mango, to cool the palate from the jerk seasonings. Flatten chicken breasts evenly to 1/2-inch thick between sheets of wax paper and move to a large resealable plastic bag. Add soy sauce, vinegar, sugar, black pepper, allspice, cinnamon, nutmeg, Scotch Bonnet pepper, ginger, and oil in the bowl of a food processor. Pulse to combine and chop pepper fine. Pour over chicken, seal bag, and refrigerate 6 hours or overnight. When ready to cook, prepare grill to medium-high heat on one half of the grill and low on the other half. Place marinated chicken down on hot side of grill. Grill 4–5 minutes on each side over the direct heat, basting once during that cooking time. Discard the marinade. Move the chicken to the cooler side and continue to grill until the thickest part of the breast reaches 165°. Serve hot. ©2016 by Cynthia Graubart. Published in Chicken: A Savor the South Cookbook from UNC Press. This salad is summer on a plate for me. The red, white, and blue brightens any summer meal. Sometimes I omit the dressing and greens and drizzle a little balsamic vinegar over just the watermelon, blueberries, and feta. Whisk the mustard and honey with the vinegar in a small bowl. While whisking, slowly drizzle in the olive oil and continue whisking until emulsified. Season to taste with salt and pepper. Add fresh herbs from the garden if available. Toss to coat the greens with the dressing (reserve any extra dressing) and divide onto 4 to 6 serving plates with the watermelon, blueberries, and feta. If using for a cookout, assemble salad ingredients together in a large serving bowl and dress just before serving. Pass extra dressing, if desired. To download and print this recipe, click here.